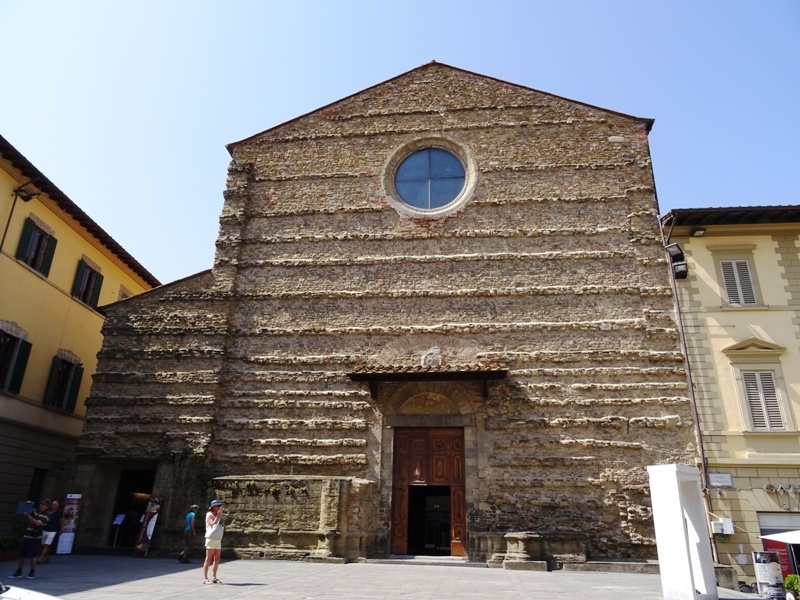 A visit to the church of San Francesco can be considered the highlight of any trip to Arezzo. The church itself is not very special. It was built in the second half of the thirteenth century (ca. 1290) and acquired its present form in the Tuscan-Gothic style about one hundred years later. The church has a simple, unadorned facade with a large rose window. Inside, we see a single nave with some niches on the right side and a few chapels on the left. The modern linoleum floor is hideous, and the tomb slabs in the centre of the nave look out of place. This is obviously not a church that deserves to be called beautiful. And yet, the San Francesco houses some of the most interesting and important art in all of Arezzo. Its undisputed showpiece is the fresco cycle about the History of the True Cross by Piero della Francesca (ca. 1415-1492). But there is much more to see. Della Francesca’s fresco cycle can be found in the Cappella Maggiore or Cappella Bacci, the main chapel behind the altar. You need a ticket if you want to see the frescoes up close and reservations are apparently compulsory. The church is still used to celebrate mass, but it is not a problem to go and see the frescoes during the services. A wall separates the altar from the chapel and the worshippers are evidently not bothered by visitors admiring Piero della Francesca’s most important work, as long as they keep quiet (I regretfully forgot to turn off my cell-phone and got a call while admiring the chapel…). Originally, Bicci di Lorenzo (1373-1452) from Florence was commissioned to fresco the main chapel. We have previously seen some of this work in Fiesole and Rignano sull’Arno. Bicci was a good painter from a family of painters – both his father and his son were painters as well – but he was also quite conservative. Furthermore, he must have been well into his seventies when he was given this assignment. It was to be his final commission. Bicci only managed to finish the frescoes of the four evangelists on the ceiling of the chapel and of the Last Judgment on the triumphal arch. 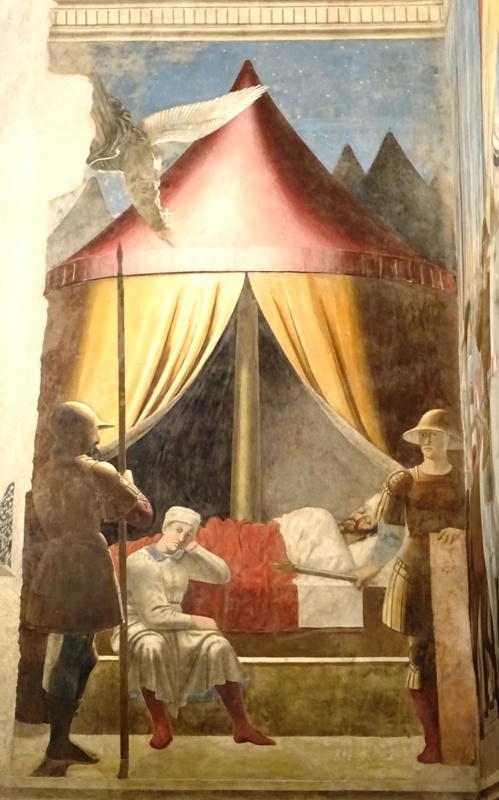 After his death in 1452, a new artist was hired, the much younger and much more innovative Piero della Francesca from Sansepolcro, which is some 25 kilometres east of Arezzo. Piero took over the project in 1452 or 1453 and – with a brief stint in Rome between 1458 and 1459 – managed to complete it in 1466. At the same time, he also painted a fresco of the Maddalena in the Duomo. An important source for the fresco cycle in the San Francesco was the Legenda Aurea (Golden Legend), a thirteenth century collection of hagiographies compiled by the chronicler Jacobus de Voragine (ca. 1230-1298), archbishop of Genua. The History of the True Cross is not told in chronological order. For artistic purposes, Piero for instance chose to paint the two battle scenes opposite each other. We should start with the lunette of the right wall. Here we see the death of Adam. His son Seth receives a seed from the Tree of Knowledge from Saint Michael the Archangel and puts it in his father’s mouth. From the seed will spring a new tree, which will provide the wood for the cross on which Jesus is to be crucified. The story continues with the central scene on the right wall, where we see the Queen of Sheba recognising a beam that is made from the aforementioned tree. She worships the beam and subsequently visits King Solomon, to whom she bows. She also grasps his hand. Solomon then orders the beam to be buried, which we can see in a smaller scene on the back wall. Right wall frescoes featuring the Queen of Sheba. Piero della Francesca then skips a few hundred years. There are no frescoes showing how the beam was found again by the Romans and used for the Crucifixion. We do see a fresco of the Annunciation, also on the back wall. The Crucifixion itself is absent, although there is a large crucifix in the chapel, attributed to the anonymous Master of San Francesco. We then move forward some three centuries again and see one of the most famous frescoes in the cycle, Constantine’s Dream, also on the back wall. The Roman Caesar, on campaign in Italy against his rival Maxentius, is sleeping soundly in his tent. An angel can be seen swooping in from the sky, carrying a small crucifix, the sign in which Constantine will be victorious (“In hoc signo vinces”). The next day, on 28 October 312, Constantine’s army fights that of Maxentius at the Milvian Bridge near Rome and manages to inflict a crushing defeat on his opponent. Maxentius flees and subsequently drowns in the river Tiber. This story is told in the fresco on the lower part of the right wall. Unfortunately, it is somewhat damaged. All participants in the battle are dressed in fifteenth century armour and they are carrying contemporary weapons. We can see Constantine brandishing a very small cross in his right hand. Then Constantine’s mother Helena joins the story. She travels to the Holy Land – this would have been in 326/327 – to find the cross on which the Saviour was crucified. A Jew who knows its whereabouts is thrown into a pit and only taken out again after he reveals the location where the cross was buried. This is again a scene on the back wall. With the Jew’s information, Helena manages to dig up three crosses. Since Christ was crucified between two criminals, the problem is which cross is His. The cross is held over the body of young man who has just died. The man is miraculously brought back to life and this makes it clear that the cross is in fact the True Cross. Helena and her entourage fall to their knees in reverence. We have seen similar scenes in the church of Santa Croce in Gerusalemme in Rome. Interestingly, the city in the background is supposed to represent Jerusalem, but it is actually Arezzo as it would have looked in the 1450s and 1460s. Discovery of the True Cross by Helena. We then move forward in time again, to the year 627. In the second battle scene, on the lower left wall, we see the Eastern Roman emperor Heraclius (610-641) defeating his Persian opponent Khosrow II on the battlefield. On the right, the kneeling Khosrow is executed. This must refer to the aftermath of the battle, when the Persian king was overthrown in a palace revolution orchestrated by his son Kavadh. Previously, in 614, Khosrow had captured Jerusalem and had stolen the True Cross. Heraclius defeats Khosrow and recaptures the True Cross. In the final scene, in the lunette on the left wall, we see the victorious Heraclius taking the True Cross back to Jerusalem. The return of the Cross brings the cycle to a close. Saint Michael – Spinello Aretino. Guillaume de Marcillat (1470-1529), the French painter and stained glass artist who frescoed the ceiling of the Duomo and provided it with beautiful stained glass windows. Madonna della Cintola – Niccolò di Pietro Gerini. I cannot discuss all the works of art in the church and will confine myself to provide some information about the highlights. Spinello Aretino was very active in the San Francesco. 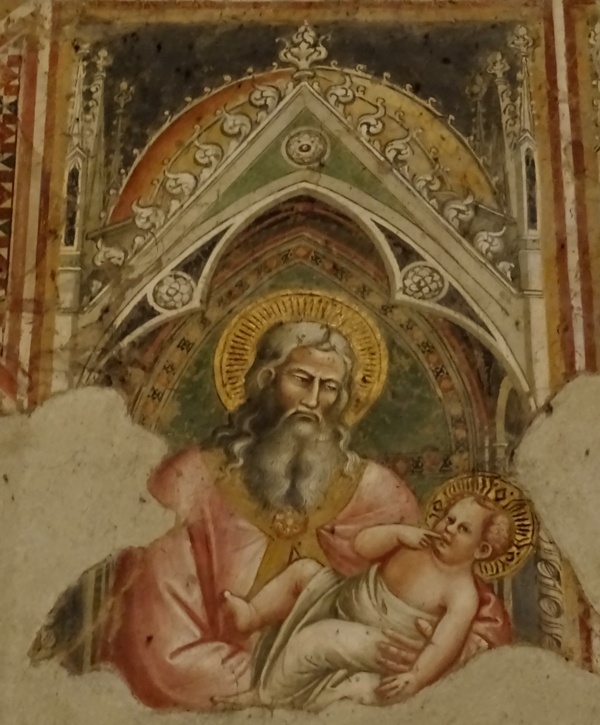 He first of all frescoed the Guasconi chapel, directly to the right of the Cappella Maggiore. The frescoes, painted in 1404, were covered in plaster during a nineteenth century “renovation”, but fortunately the plaster has now been removed again. The most interesting frescoes tell stories of Saint Michael the Archangel. We see him appearing to Pope Gregorius the Great atop Hadrian’s mausoleum, which subsequently became known as the Castel Sant’Angelo. The whole story is told elsewhere. The altarpiece in the chapel is also interesting. It is the work of Niccolò di Pietro Gerini. In the centre of the panel we do not see the usual Madonna and Child, but the Virgin of the Assumption. The Virgin, dressed in beautiful white robes with a golden hem, is painted above her tomb. She is taken up to Heaven by six angels and can also be seen handing over her girdle to Saint Thomas, who is kneeling below her. This depiction of the Virgin is known as the Madonna della Cintola. On the left are Saint George and Saint John Gualbert (see Florence: Santa Trinita). One the right we see Saint Lawrence and Saint Franciscus of Assisi. The altarpiece is very colourful. Saint Simeon – Spinello Aretino. An Annunciation by Neri di Bicci can be found in the Tarlati di Pietramala chapel, while Michele da Firenze’s tomb for Francesco Roselli is in the Cappella di Pagno di Maffeo. 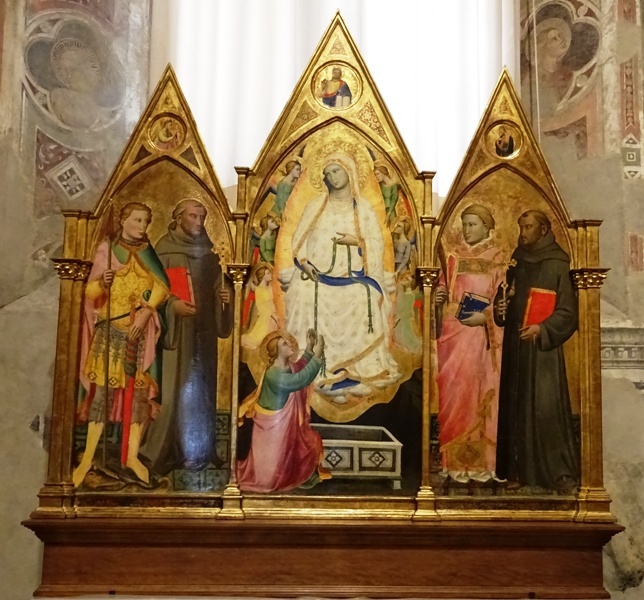 Lorentino d’Andrea painted scenes from the life of Saint Antonius of Padua in the eponymous chapel in the San Francesco. All of these chapels can be found on the left side of the church. Traces of frescoes remain on the wall of the right side of the church. Some frescoes, although damaged, are still in good condition. Many are attributed to either Spinello Aretino again or to Andrea di Nerio (died before 1387), a somewhat obscure but very important painter from Arezzo. Di Nerio is considered Spinello Aretino’s teacher, so it is understandable that even experts are divided on the question which works are by Di Nerio and which by his pupil Aretino. Other frescoes on the right wall are definitely by Aretino, such as the lovely fresco of Saint Simeon holding the Baby Jesus in his arms. The scene refers to the story of the Presentation of Jesus in the Temple, as told by the Gospel according to Luke. Window by Guillaume de Marcillat. A final highlight in the church is the gorgeous stained glass rose window made by Guillaume de Marcillat. 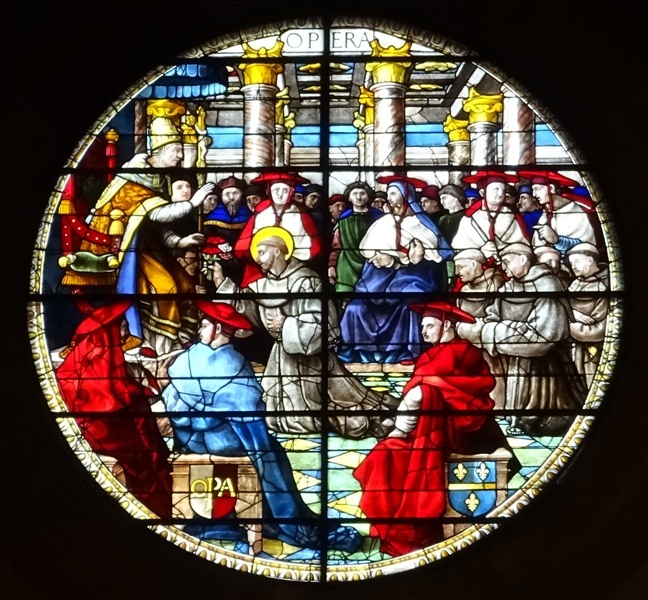 The window shows Saint Franciscus presenting red and white roses to Pope Honorius III. The roses are in bloom, even though it is January. 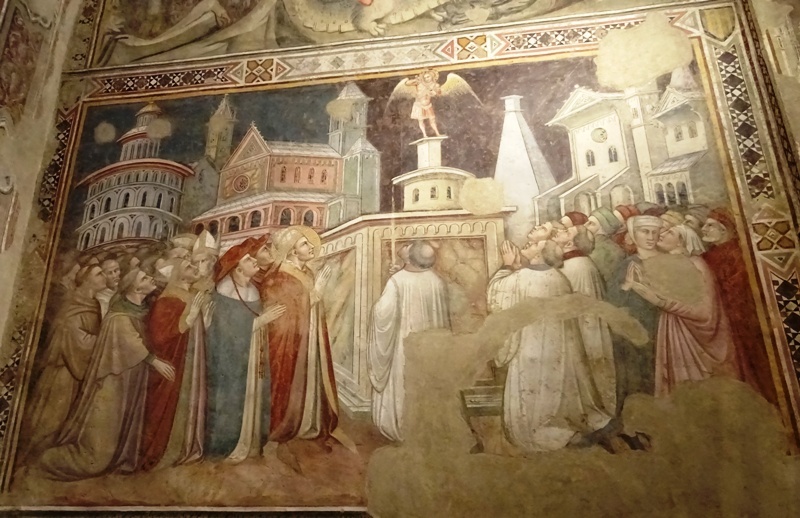 It has been claimed that the man between the two cardinals in the centre is actually Piero della Francesca. The painter Raphael (1483-1520) is also supposed to be in the scene. These claims can be found on an information panel in the church, but I have not found any other sources to back them up. So all in all, the San Francesco may not be a beautiful church, it is certainly a very interesting one and its collection of artworks is impressive. 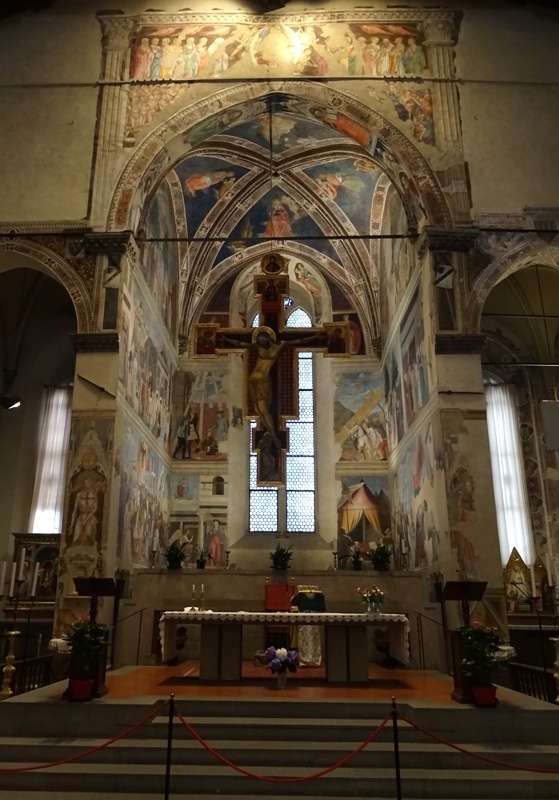 My travel guide to Florence and Tuscany provided some basic information about the San Francesco and the History of the True Cross. Additional information was provided by the many information panels in the church. Italian Wikipedia has a detailed article about Piero della Francesca’s fresco cycle, which was also quite helpful.